Is the second wife always the other woman? Despite a post sometime back about all that I watch on TV, I actually watch very little of TV in a day. And there’s just one Hindi soap I follow. It’s a serial on child marriage and its repercussions, called “Balika Vadhu”. And I’m totally loving the realistic portrayal of what happens to couples who’re exposed to the modern world as it is, and have to deal with regressive traditions like child marriage. If you follow the show – a lot of people do – you can totally skip the next paragraph. Otherwise, you might want to know what I’m talking about. In brief, the story is currently revolving around this couple who got married as kids, grew up as friends and fell in love with each other as adolescents. But when the boy moves out of his village into the city to study Medicine, the ties of childhood begin to snap. He falls in love with a girl in the city, lies to her about his marital status, initially because he’s embarrassed to own up he’s had a child marriage, and later because he doesn’t want to lose her. He falls out of love with his wife, who is still besotted by him. Now, the boy’s family has cut off all ties with him after learning that he’s virtually living in with another girl in the city, who he wants to marry. His wife, predictably, is distraught. But this isn’t about my favourite serial. It’s about the issues it brings up. At the very apparent level, it’s about child marriage and the debilitating effect it has on the lives of the people involved. The boy has fallen in love with another girl and thinks he’s done no wrong because he realises that child marriage is an outdated concept. The girl, on the other hand, is forced to respect the tradition because she has no option. At another level, it’s about rural migration to urban India. The village boy who tries to fit into the city life, changes his name even, because he doesn’t want to sound like a rustic. He lies about his marital status because he knows his friends from the city will not understand how he’s actually survived a child marriage. But this isn’t the story of just this boy. It’s how many stories in India go. And just as the boy in the serial has fallen in love with a city girl, promised her marriage, and hidden his true identity from her, millions of Indian men end up doing that. This is not an opinion; it’s a fact that women’s organisations in cities will verify. Because often these men marry their love interest in the city, maintain two parallel families and wives – one in the city and the other in the village, and by the time one woman gets to know about the other, she’s reached a point of no return in the relationship. Since bigamy is not recognised by the Indian Marriage Law, the second wife, usually the one who would appear to be smarter, more suave because she’s from the city, is at the receiving end of an unfair deal. At the end of the day, she has no legal standing, and if her husband chooses to abandon her, her marriage is only as good as a live-in relationship. Thankfully, the Supreme Court has begun to see that this is an injustice that no woman deserves. Also, the Domestic Violence Act accords live-in relationships legal status because the lawmakers understood that second wives couldn’t be left to deal with their problems without the backing of law. What happens to children produced as a result of such marriages? Why should they be treated as illegitimate? Imagine, to love and trust someone with your life, only to realise one day that you’re just ‘the other woman’. A lot of such women would continue to play the farce of the relationship, because exiting it would be more painful. But those who take a stand must also suffer the ignominy of accepting that they’re not really the woman to the man they live with, that they thought they were. And to the world, they also become the husband-stealer, the wicked woman who ensnares others husbands. But she isn’t always that, is she? It all started because a man decided to migrate. I’m not saying there aren’t men in urban India who don’t fool women thus. But this is about the problems of migration that migrants even within the country bring with them. And the question is – can this man be blamed? What of his right to happiness with another woman? What of practices and social pressures that make it impossible for you to cut yourself off from past relationships? Do you think this man is only a villain or a victim as well? …I’m just not sure if it’s for their good or not! I’m posting some links, and excerpts from these links, about some out-of-the-ordinary news about children and their lifestyle. 2. 8-year-old Botoxed by mother – now the mother has lost custody of her daughter! She has just been named one of the world’s best-dressed women, right up there with Samantha Cameron and Alexa Chung. Yet Suri Cruise is only five years old. She is barely out of nappies, which is surely a design statement far away from a little girl like her. By what or whose twisted definition is she a woman? We were sitting in office today when a colleague got a call that his sister had scored 91% in her Board exams. A whoop of joy went around! Soon after, another colleague got a call telling how her nephew had also scored 91% in his Boards. Apparently, he was crying because his marks were too low! Thankfully, we’re beyond the stage of looking to our percentages and exam results as the be-all-and end-all of our lives! But even we were not I wouldn’t mind it so much. Because strangely, I loved studying! And I loved my Class X Boards – they were a breeze! I scored a 90.4% in them (I never forgot to mention the .4 because another o.1 and I could’ve said 91%), 15 years ago! And I was jumping for joy, not wallowing in sorrow. I love to relive the moment when I got my result. It’s one of my favourite moments in life. I was the first one to collect my marksheet from the school, because I was the first in the queue. And when I came out of the Principal’s office, there was no one outside with whom I could compare marks. I used to be pathetic in Maths and had taken a calculator along to calculate my percentage. And I must have punched in my marks at least thrice before I could believe it actually was a 90.4%! A friend’s mom who watching me, came up to me and asked how much I had scored. I gave her a perplexed look and said ‘it can’t be true’ and calculated my percentage all over again. And the sweetheart that she was, she understood I was too dazed to know I’d done really well, and hugged me so warmly, I still remember that hug. By the way, she’s one of my favourit-est aunties because she shared in my joy when there was no one else to share it with me. And she still meets me with as much warmth as on that hot summer day when she congratulated me on my result. Interestingly, a lot of my friends and classmates who were straight-As students, did not score as well as me that year. And though I was the one pathetic at Maths, they’d scored lesser than me! That really put them off! Not that I was ever less than an above-average student, but they were the ones who always excelled. Honestly, it surprised me too that they’d scored lesser than me. But over the years, I realised who cared for a Class X percentage? When I went to take admission in college, no one even gave my 90.4% a second look. It meant nothing. And it means very little now. When I applied for my job too, I don’t think my 90.4 stood me in any good stead, and I’d have fared as well in my interview had I scored an 85%. But back then, it meant the world to me. Also, academic performances have very little to do with how successful you are in life. A lot of successful people from my batch are the ones we used to call back-benchers. The CBSE Board has now done away with Class X Boards, to reduce stress on students. A wise decision, methinks, because there’s undue emphasis on marks and percentages these days. I think academic performances are important, just as performing well in anything you attempt in life is. And if I were to go back to school, I would like to ace my exams and tests, but I don’t think it’s fair to every student who doesn’t have an aptitude for the kind of studies that our system offers and still has to appear for the exams. My sister hated exams! She could never understand why despite studying everything, she wasn’t in the top 10 in the class. But most of us have our Board exam/result memories. Tell me if your memories are made of stressful experiences or joyful remembrances? Are Indians wearing clothes meant for firangs? The other day, The Guy and I had gone shopping for clothes. I was looking for some tees and tops and landed up at the usual haunts – Van Heusen, Allen Solly, Benetton… and other clothes available in Lucknow. And while I found nothing to my liking there, I noticed a rather disarming trend. The posters at all these stores showed women who looked nothing like me, sporting the clothes that these brands expect me to buy. 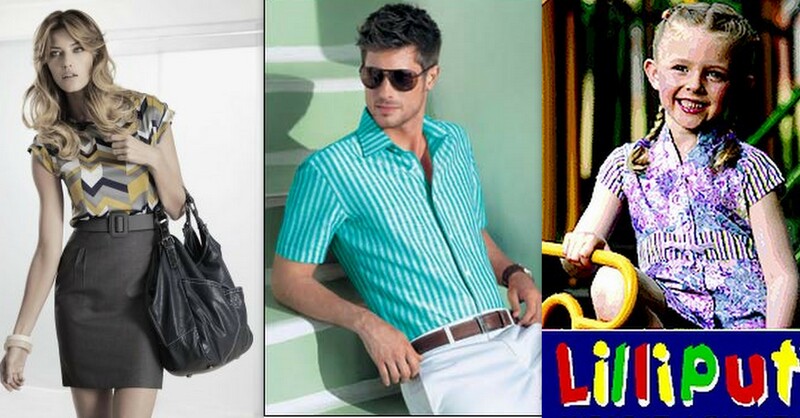 (L-R) Van Heusen uses fair-skinned female and male models, while Lilliput uses firang children in their ads. There are other such Indian brands too. How difficult is it for clothing brands to understand that the Indian body type is nothing like the American/European type? And how difficult is it to see that what may suit the fair skinned folks may not be ideal for complexions in the Indian subcontinent? Why are they then selling clothes to us by modelling them on tall, super slim, fair women with blonde hair, near-flat chests and butts? At my slimmest, I couldn’t look like that. Not just for women’s apparel. Firang models seem to be the preferred choice even among male and child models. Do clothes look more appealing on someone who is five shades lighter than the people they’re intended for? Or should Indians aspire to look like someone they genetically never can? With more and more foreign apparel brands coming into our country, like Zara, Mango, FCUK and other high-street fashion brands, there needs to be greater awareness about customising colours, shapes and sizes to Indian standards. Otherwise we’ll have more and more men and women in the country (there already are enough, aren’t they?) trying to fit into clothes meant for people in an altogether another continent. For an average Indian woman, who’s more curvaceous than her counterparts in say Britain, shopping at these places is a pain. Because you enter a trial room hoping to look like that girl in the catalogue, only to realise that the clothes don’t fall on you the way they do on her. But the onus of correcting the imbalance is greater on Indian brands, trying to lure the Indian consumer. I can for once think that a Mango or Zara, not being an Indian brand, has non-Indian models, but what justification is there for brands like Van Heusen and Lilliput to be putting firang models on their cover? To be fair, I know there are market strategies at play that force these companies to decide in favour of fair-skinned foreigners over Indian models. I was reading a case study of Killer Jeans, an Indian brand of jeans, that wanted to posit itself as an international brand. So, they resorted to using foreign models in their publicity material, to give the impression that they are an international brand. Apparently, it worked. But as a consumer, at least I would be convinced of the standards of an Indian company using Indian models too. Wouldn’t you? Sunday’s come and almost gone and I’ve done zilch to make the weekend sound cool to anybody who’s into that kind of stuff. Last night, there was the launch of a lounge at a five-star, where we didn’t go. From where everyone was supposed to descend on a pub that’s just re-opened, where we didn’t go either. There was a party at a club, where we were not invited! We did go out for dinner, etc with Sis & Co. (includes three sisters, hubbies and their bachchas) to a staid/safe place, but that’s not the sort of thing we classify as cool these days, I believe.I’ve just slept the whole of today, been wasted totally. And with Sunday drawing to a close now, I can feel the pressure building – to have fun. I don’t have pics on my phone to upload on FB as proof of how much fun I had – that’s in fashion these days, right? Or put snazzy messages on BBM at 4 in the morning to tell the world how we were partying into the wee hours last night and came back home sloshed. Because we didn’t. We just came home a little past midnight, slept, woke up, ate and slept some more. And then woke up, and at again and now we don’t even have a plan for the night. And we’re blaming it all on the heat. Can you imagine how stressed I’m feeling right now? No movie tickets in hand, no dinner reservations, not even new clothes to wear and feel good in! Gosh, I feel like I just took VRS from my social life! But I guess I graduated from trying to do the cool things a while back. And now weekends are about a little bit of shopping, a dinner with friends/family, a movie and that’s about it. It almost sounds boring, compared to what I used to be upto not so long ago. But I’m enjoying where I am. And haven’t cared much for appearances. I’m not starting now! So, what was your weekend like? Lazy or super hectic? I’m as excited as a baby! You see the expression on a baby’s face when you give him a new toy, or when he sets eyes on something that truly fascinates her? That’s how I look right now. After dilly-dallying and procrastinating, and honestly not minding Blogger for all these years (they were 5 whole years! ), I finally moved to WordPress after the huge disappointment on Friday, when I lost a post (I could re-publish it here, because it was saved in my drafts) and so many comments! And now that I’m here, I’m not minding this either. It’s going to take getting used to being around here, and I’m still taking baby steps to unravel the complexities of WP, before I really begin to enjoy them. But, being me, being the romantic me, all fascinated by the shiny, newness of this place, I’m loving this exploration too. I’m a little scared of pressing tabs too freely just now, not knowing where they’re going to land me, but haule haule ho jayega pyaar, I’m told! Till then, all you WP advocates, make me feel welcome here! >Did my blog get stereotyped? Very recently, I realised that I was reading barely a couple of blogs by men! And then I realised, that there are hardly any men reading my blog. Or at least commenting here. Except for a very few. How is that? Do men not feel welcome here? The answer could be in the question – why don’t I read any men’s blogs? I used to, till they all became very irregular. Like UsP’s. And the Quirky Indian’s, and Rambunctious WhipperSnapper among a couple of others. But obviously, I can’t start reading blogs to correct the gender imbalance in my blog roll. On the other hand, while I know I bring a feminist point of view to a lot of things, do I write essentialy feminine stuff that men can’t relate to? I talk about myself a great deal here, but that shouldn’t make men wary of this blog now. And if it does, that thought is so offensive to the woman in me! I also talk a great deal about society, and other vague stuff that’s not necessarily classified into masculine/feminine categories. So why is it that men don’t make their presence felt too often around here? However, I do see quite a few of the male species on the Followers’ list. So, will the men out there, please stand up? To the women, I’d like to ask – is blogging something women take to more than men? If yes, then what is it about blogging that appeals more to a woman’s sensibilities?